BEIJING (CNN) -- It's a little after 10 a.m. on Sunday, and the Rev. Elyn MacInnis leads her flock through the service. A small but harmonious choir sings hymns. Children cry and call out to their parents. Scripture is read, a sermon is offered, bread is broken. Many Protestants would find themselves at home in the Congregation of the Good Shepherd. But its location, in China's capital, makes it unusual -- and perhaps quite timely. Is China's health care system heading for a crisis? The Congregation is non-denominational. 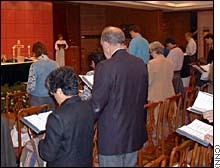 Its worshippers are from Britain, South Africa, Canada, New Zealand, Belgium and the United States -- diplomats, business executives, journalists and members of the international community. The group uses a rented space in an office-apartment complex, and because of the transient nature of life in the international community, its membership is always turning over. 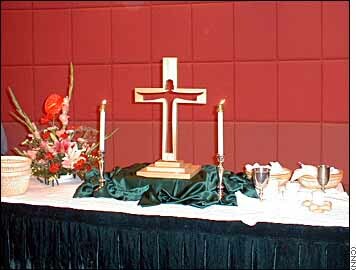 But it also has a cohesiveness many established churches in the West would envy. By law, the Congregation of the Good Shepherd is not open to Chinese nationals. It is, however, a Christian group well aware of China's growing spiritual awakening. The Chinese, says one member of the congregation, are "thirsty" for something more in their lives. 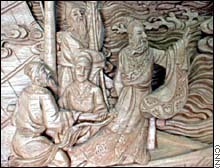 Christianity has been part of Chinese life since its introduction by Catholic missionaries in the 1500s. Protestants followed in the late 1800s. The Treaty of Nanking, signed after China's defeat in the first Opium War of the 1840s, opened China for development and exploitation by Western interests. 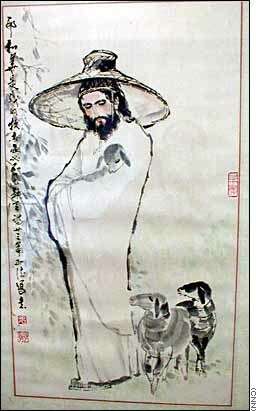 It also pressured the Qing (Manchu) Dynasty to protect missionaries and their converts. Christians have been linked to several events that presaged the downfall of the Qing. The devastating Taiping Rebellion of the 1860s was sparked by a man who, after a series of visions, decided he was the younger brother of Jesus Christ. In 1900 missionaries and their converts were attacked by supporters of the so-called Boxers, militant practitioners of a spiritually based martial art who were bent on destroying non-Chinese influences. The suppression of the Boxers by Western forces led to the last gasp of the Qing, 11 years later, and the end of China's dynastic rule. Two of China's Republican rulers, Sun Yat-sen and Chiang Kai-shek, were Christian converts. Other Chinese leaders were educated in missionary schools. By 1949, when the Communists scattered their Nationalist rivals, there were an estimated 700,000 Christians in China. In 1950, as Cold War tensions grew and a hot war exploded on the Korean peninsula, China's Catholics were forced to break their ties with the Vatican. At the same time, 150 Chinese Protestant leaders severed ties with their non-Chinese missions. The so-called "Three Self Movement" declared Chinese Christian support of the government and called on the churches to be self-supporting, self-administrating and self-propagating. The Cultural Revolution of the 1960s and '70s was ruinous to all forms of religion in China. For Christians, as for any group of person deemed "counter-revolutionary" by Mao Tse-tung's radical Red Guards, it meant persecution, imprisonment, and in some cases, death. By the early 1980s, as Deng Xiaoping began his reform programs, religious freedom began to return. The China Christian Council (CCC) was formed, working to re-establish churches and to reclaim property. 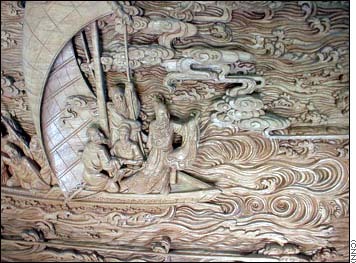 Detail of a wood carving of Jesus Calming the Waters, by Chinese artist Zhang Wan-Long. Click for wider version of the carving. 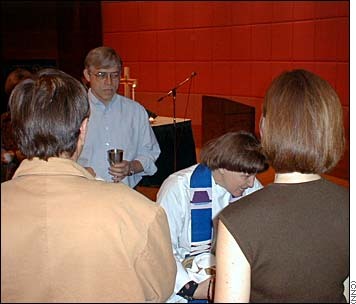 By the late 1980s the revival of Protestant Christianity began to take on a life of its own. CCC head Han Wenzao said at a recent international Christian gathering there are more than 13,000 Protestant churches in China -- compared to just three churches in 1979. Han said new churches are opening at the rate of three every two days. The major challenge now facing the church, he said, is the lack of trained pastors. "Between 1981 and 1988 there were estimates of up to two million Bibles printed in China," says Peter MacInnis, the husband of Rev. MacInnis and former manager of China's Bible printing house, the Amity Printing Company Limited. "From 1988 to the spring of 1999 there were 20 million printed, and they are now being printed and distributed at a rate of more than three million a year." 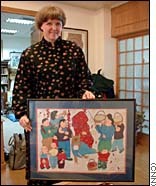 What is largely unknown outside China is that a great number of Christian organizations are not connected with overseas missionary groups. Some of these so-called indigenous Christians pre-date the Communist government and pride themselves on their independence. A substantial number remain beyond Chinese institutions, their followers still cautious after the harrowing days of the Cultural Revolution. Even some of the "house" churches, which operate outside official government sanction, have been given a great deal of leeway by the authorities in return for a level of cooperation. "In some provinces, house churches are registered with the government," says Rev. MacInnis. "When you register a church, the government gives you land and helps you build." The MacInnises stress that enforcement of religious groups can vary greatly throughout China, and that the outside perception of a widespread crackdown on Protestant churches is over-simplified. Tensions do remain between the Vatican and the government. Earlier this year Chinese authorities refused to allow a visit to Hong Kong by Pope John Paul II during his tour of Asia this fall. And outside monitoring groups say arrests of "underground" Catholics continue. Recent headlines surrounding the Chinese government's ban on Falun Gong -- a meditation sect that claims tens of millions of adherents -- have drawn new attention to the varied spectrum of emerging faiths and cults. Some rely on traditional cultural beliefs, such as objects with magic and restorative powers. Others, like the Eastern Lightning Sect, are quite unique. The Eastern Lightning is a highly secretive group of millennialists who believe Jesus Christ is returning to earth, and what's more, He is a woman. The underlying theme behind all these groups, mainstream or fringe, apparently is a deep yearning for some spiritual direction. Many Chinese, finding that much of what they believed in for years is now gone, are looking for something better within themselves. Some observers believe this resurgent interest in faith portends a new stability for China, political and otherwise, during the next 50 years. Bruce Kennedy was a Chinese history major at Bowdoin College in Maine. He worked for Visnews, the international television news agency, for five years before joining CNN in 1988. After a stint at CNN International, he began work at CNN Interactive. Kennedy has extensive experience in East Asian affairs, having studied and worked in the region.